American manned lunar lander. Study 1952. Von Braun's first lunar lander design was an immense spacecraft, larger in earth orbit than a Saturn V booster. Status: Study 1952. Thrust: 1,735.00 kN (390,043 lbf). Gross mass: 3,964,000 kg (8,739,000 lb). Unfuelled mass: 64,500 kg (142,100 lb). Specific impulse: 285 s. Height: 49.00 m (160.00 ft). Diameter: 33.00 m (108.00 ft). Three of them would take a 50-crew expedition to a six-week exploration of the moon at Sinus Roris in 1977. Von Braun outlined the first expedition to the moon only after he had calculated the necessary trajectories and masses for an expedition to Mars. Like the Mars expedition, the first lunar journey would be a grand journey, modeled intentionally on the exploratory trips of Columbus. No fewer than fifty engineers and scientists would fly to the moon aboard three spacecraft assembled in earth orbit. At 3964 metric tons each, one of these spacecraft alone, already in earth orbit, had the same mass as the Saturn V used 16 years later to launch the actual first lunar voyage from the earth's surface. Two of the lunar landers would house 20 crew, and one 10 crew plus 259 metric tons of cargo for lunar exploration. The cargo lander would be left on the lunar surface; the crew would return in two of the landers, 25 men per spacecraft. The spacecraft, in a rehearsal of techniques for later Mars expeditions, would be assembled over an eight-month period near a space station in a 1730-km-altitude 2-hour circular orbit (this orbit was later found to be within the then-unexpected Van Allen radiation belts and therefore unusable by a manned spacecraft). No fewer than 15 immense reusable Von Braun space shuttles, each with a payload of 33 metric tons, would have to fly a total of 360 missions to deliver the payload to earth orbit for the three vehicles. Each shuttle was assumed to have a turn-around time of ten days: three days to recover the lower stages and tow them by boat back to the Christmas Island launch center, and seven days for refurbishment, restacking, and fuelling with storable propellants for the next launch. Prior to the first landing expedition, a manned lunar orbiter would be sent from the station to lunar orbit and back to comprehensively photograph the lunar surface and allow selection of a suitable landing site. Both the orbiter and the landers would use rocket braking on return from the moon to match the orbit of the space station, and finally rendezvous with it. This use of rocket braking on return from the moon was the main reason for the enormous size of Von Braun's spacecraft, but was driven by the logic that the expedition design use only established or immediately foreseeable technology. Shapes, materials, and aerodynamics for re-entry from lunar distances were a complete unknown in 1952 - therefore aerodynamic braking back to earth orbit or the earth's surface was ruled out. Final site selection would depend on the results of the photographic mission, but a site at Sinus Roris was considered the most suitable. Each of the moon landers would be 49 m long and 33 m in diameter. They would be powered by 30 rocket motors, each of 5.9 metric tons thrust, burning nitric acid and hydrazine stored in collapsible plastic tanks. Each engine had a specific impulse of 285 seconds. Propellant tanks were sized for each major maneuver, and dropped after the rocket burn. They were arranged around a light metal framework. The thrust to weight of the spacecraft was very low initially, resulting in significant velocity losses during translunar injection. The expedition staff would consist of: a commander; 15 pilots and navigators; 8 radio and electronic technicians; six engineers; one astronomer and one observer; three photographers; a geologist, a mineralogist, a fields expert, specialists in laboratory work in mineralogy, geology, and microscopy; a geophysics team including a seismologist, a ballistics expert, and a gravity expert; and a five-man physics team. The crew would travel in a five-level spherical cabin, pressurized to 0.55 bar with a mixture of 60% helium and 40% oxygen. Solar thermal systems would power electric generators. A concentrator area of 90 square meters would be sufficient to produce the 35 kW of power needed. Batteries would be charged to provide power during the lunar night. 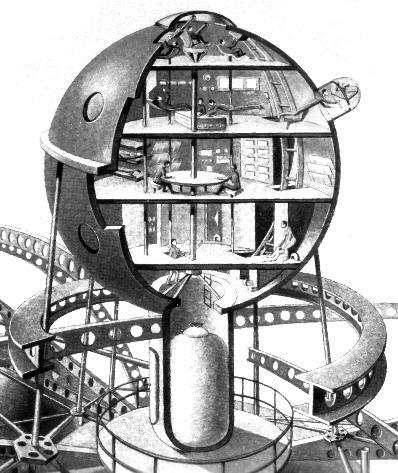 The crew would spend six weeks in lunar exploration, housed in a buried surface shelter made from the two halves of the emptied cargo container. Three pressurized caterpillar-tracked rovers would be used to haul the cargo into position on the surface, and take the crew on traverses near the base. Each rover could normally support up to seven crewmembers for up to 12 hours. With the addition of three trailers of supplies, two of the rovers would take a ten-man team on an 800-km traverse to the crater Harpus, including determination of the makeup of the bright rays emanating from the crater. Crew Size: 25. Structure: 42,300 kg (93,200 lb). Reaction Control System: 1,350 kg (2,970 lb). Navigation Equipment: 2,250 kg (4,960 lb). Electrical Equipment: 2,200 kg (4,800 lb). Crew Seats and Provisions: 2,600 kg (5,700 lb). Crew: 2,250 kg (4,960 lb). Miscellaneous Contingency: 950 kg (2,090 lb). Environmental Control System: 4,700 kg (10,300 lb). Family: Lunar Landers, Moon. 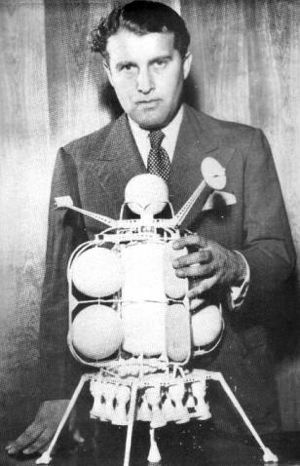 People: von Braun. Country: USA. Propellants: Nitric acid/Hydrazine.